The energy transition ahead is unlikely to be a straight-line substitution of one fuel source by another. It’s more likely a vast disruption, globally, as solar and wind smoothly capture power growth, and incumbents can only downscale via a succession of large retirements. In 2016, global energy demand grew just 1%, 50% less than in the previous decade. Yet, in the single month of July 2017, China installed 10.5GW of PV solar power capacity, and began connecting it to the sprawling Chinese grid. In power generation terms, that is the equivalent of constructing a large nuclear station, such as the UK’s proposed Hinkley Point C (slated for start up in 2027), in the space of four weeks, at about half the cost (1). At current installation rates, by year-end China will be generating over 350 TWh of electricity using solar plus wind, which is more than the UK, the world’s sixth largest economy, consumes in total over a year. It’s worth noting that in 2009, China generated practically no electricity from solar and wind at all, relying mainly on coal. In 2016, existing Chinese plans for over 120GW of new coal generation were cancelled. This is how energy is changing. It’s convention to categorise wind and solar with nuclear and hydropower as “renewables”, due to their carbon-free nature. But this confuses how wind and solar differ from other major energy sources – it’s their rapid, scalable, manufactured, high-growth nature that truly sets them apart. The dominant carbon-based and carbon-free energy sources of today – coal, oil, gas, hydropower and nuclear – generate energy only in one-off, large, time-consuming and expensive projects. This is because they have to combine two complex supply chains: one to make the fuel (think coal mines, oil and gas platforms and refineries, dams and uranium mines), and one to create the energy delivery system (think thermal power plants, gasoline stations, storage facilities, pressurized pipelines, hydropower and nuclear plants). Because of this energy companies or utility providers tend to operate economically only by adding huge new increments of fuel or plant to generate enough energy volumes, over extended periods, to repay investments. In turn this forces them to rely on giant custom-designed construction projects, which habitually over-run in cost and schedule, often dramatically. As a result, they are inflexible to changes in energy demand, producing classic energy commodity cycles of over and under-supply: think OPEC’s current dramas in the oil market. The dominant energy industries are all big, but they are extremely fragile – they can only scale up in single sizes, and scale down the same way. Wind and solar are an opposite form of energy: they are manufactured, assembly-line technologies dedicated to simple, standardized components: PV solar panels and wind turbines. They are fuel-free, relying on the efficient capture and conversion of the earth’s (infinite and in-place) solar and wind energy. This makes them highly scalable: they can operate effectively at capacities from a few MW to several GW, over three orders of magnitude. Think roof-top solar, small-scale wind arrays, offshore giant turbines and the behemoth solar farms that China is now deploying. And it means the energy they produce can be deployed quickly, and in phases, creating steady growth, with declining costs. In other words, flexible and robust. Note wind/solar’s steady growth versus the cyclical commodity energies: by the end of this year it’s almost certain that wind and solar will be the largest provider of global energy demand growth, at over 50% of the total. The problem for single-size commodity energies is that as demand tends to zero, the ability to add any new capacity stops dead: one-off large additions are no longer required when solar and wind can provide widespread flexible supply. The paper forecasts that solar could provide up to 50% of the world’s electricity requirements by 2050. In that case, emissions would drop far below 50% pa, and the Paris target of 2°C becomes achievable as fossil fuel emissions are shoved aside. Similarly wind technology is scaling rapidly; the average size of offshore UK turbines, at 8MW, is over twice the size of those originally installed just 10 years ago. 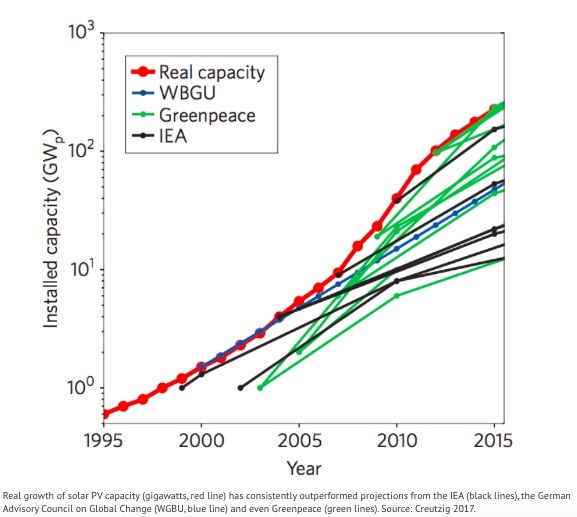 Solar and wind seem to be benefiting from positive reinforcement of capacity deployment and technical research – in turn accelerating cost and performance improvements above forecasts. Reinforcing this, smaller-scale (but mega-scalable) energy stimulates a variety of new investment options. In the US, Xcel Energy’s recent early move from coal to wind and solar, and Duke Energy Florida’s decision to replace nuclear with solar and EV charging networks illustrates the overall change. Meanwhile auctions for solar and battery storage projects in Australia have attracted several hundred participants. The dominant fossil fuel, hydro and nuclear model of investment via huge balance sheets and internal cash-flows looks slow-paced and high risk by comparison. It’s common wisdom that the dominant fuels system is too established to be quickly deposed: long dominance creating long-term dependency. But as solar, wind and battery projects advance MW by MW, week by week, they are assembling a vast new global, learning network of manufactured energy. Once in place its running costs will tend toward zero, and its energy source will be free. So the transition ahead is unlikely to be a straight-line substitution of one fuel source by another. It’s more likely a vast disruption, globally, as solar and wind smoothly capture power growth, and incumbents can only downscale via a succession of individual large retirements.